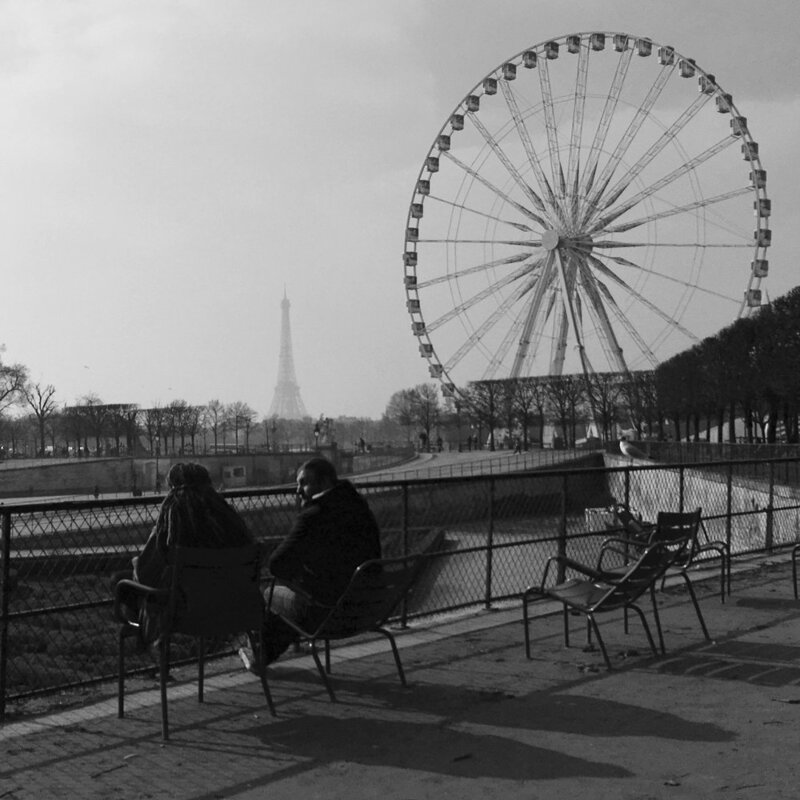 In late February, there was a gap in my work schedule so I flew to Paris to visit my brother. He had been working and living at the hotel for three months on a temporary assignment. Luckily, a short reprieve from several weeks of rainy weather happened while I was there so it was possible to walk and photograph around the city. When my mind is not bombarded by the demands of my day job, it allows creativity in and Paris brought me so much inspiration. It fed my soul. 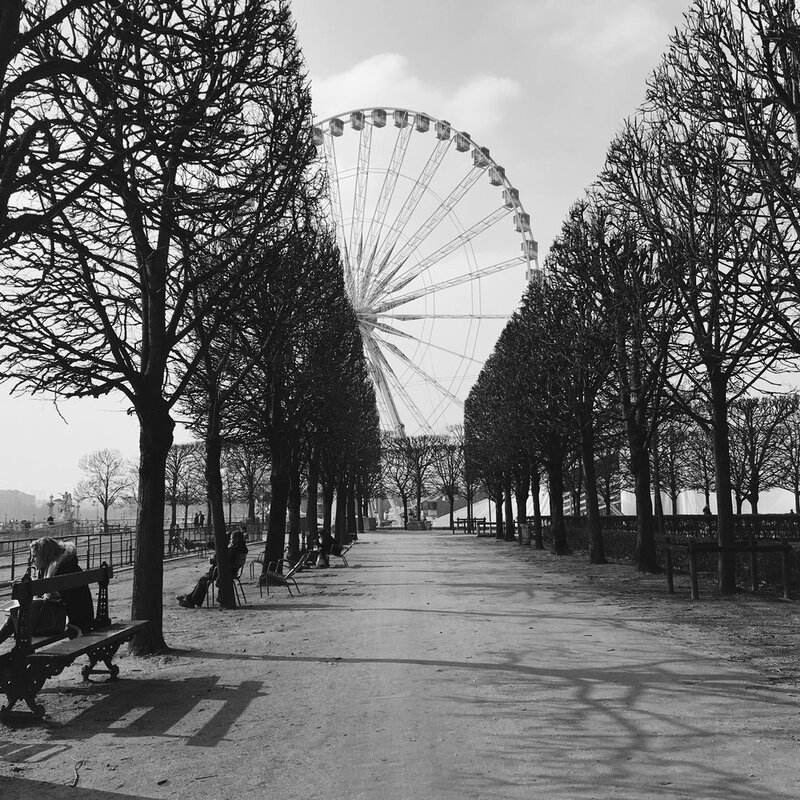 View of The Big Wheel at the Tuileries Gardens. Hearing mass on the first of day of a new year is something that I’ve been doing the last 4 to 5 years. With a clean slate, I always want to begin by saying thank you for all that has happened the past year and for what is to come. Smoke from the incense lingered above Father Raphael during New Year’s Day mass. St. Joseph the Worker Parish Church. Berkeley, CA. I stopped dead on my tracks when I saw the leaves scattered on the grass and the Christmas lights wrapped around the tree trunk. I love the juxtaposition. For me, it spoke of the transition between the end of autumn and the ushering of winter/holiday season. On a deeper level, it is a metaphor for that familiar place for some of us who are in this life journey when we’re not quite where we want to be. My cousin calls it “a holding pattern.” Pema Chodron teaches us to remain open and be friends with whatever is happening at this moment no matter how uncomfortable it is. The only way is through. Appreciate its beauty. Yerba Buena Gardens. San Francisco, CA. 2017. Last August, I had two hours to kill before meeting my colleagues for dinner. Everyday, we take a U-turn on this road which takes us to the I-80 on ramp to the Bay Bridge and eventually to the city. Today, we drove a bit further towards the water and parked near the Marina for our early morning walk. How different can this scene be with the fog and the warm golden light from the sun? I was stunned. With the highway obscured by the fog, I am temporarily transported to a different place in a different time. Beautiful— so beautiful. And, the camera is the perfect tool to capture this fleeting moment. Powell Street, Emeryville, CA. 2017. One of the best things about working in a hotel especially this new company I am with entitles their employees to complimentary nights! The universe aligned and I was able to get a night at the hotel plus I had enough miles to fly out to Sydney from Manila. My cousin was also in town so I was able to stay with her for a few nights. I haven't seen her since 2004 and have never met my niece. I wanted to spend some quality time to catch up. So, I took advantage of the opportunity and visited the city for the first time. I loved it! It's a cross between San Francisco and Santa Barbara because of the nearby beaches that could be reached via ferry. I did the whole tourist thing and tried my best to take photographs that describes my experience. When given another chance, I would love to come back there and stay longer possibly travel to Melbourne or stop over if we ever make our way to New Zealand. Tourists at the commuter Ferry from Circular Quay. July 2017. View of the Sydney Harbor Bridge from the Hop on Hop Off Bus. June 2017. Three Sisters. Blue Mountain. July 2017. I enjoyed an afternoon soaking in a jacuzzi with my siblings and my niece. A friend of Malyn's was kind enough to have us stay overnight in their vacation home in Punta Fuego, Batangas. It is rare that we get together so I always make sure I document these fleeting moments. We caught up on family stories and of course, we shared so many laughs. Punta Fuego, Batangas. June 2017. Puenta Fuego, Batangas. June 2017. We passed by this gentleman who was talking to his buddy seated inside the moving truck. He saw me as I raised my camera to my eye. I decided to make a quick portrait instead of waiting for a moment since he had the right stance and was juxtaposed perfectly with all the other elements within the frame. 50th Street between 5th & 6th Avenues. New York City. I didn't shoot much in a way of street photography when I was in NYC this past week. It was more of an R&R kind of vacation but I still had my camera around my neck in case a moment presented itself. And, this gem did! 48th Street between 6th & 7th Avenues. New York City, NY. For me, this image that I captured at the New York Botanical Gardens sums up the beauty of Dale Chihuly's work. He draws inspiration from nature and his organically shaped glass work "merges" with it. And, the light above the greenhouse added to this beautiful photograph. As I approached one of the reflecting pools at the 9/11 site, my eye immediately caught these single white roses lodged in a few of the names around the perimeter. A sign nearby gave the explanation: "As a tribute, the 9/11 Memorial places roses upon victims' names on their birthdates." And, so I began photographing the flowers as I walked around the pool This particular image was spiritual and somewhat haunting. The morning sun creating a shadow between two buildings and a halo on the white rose against the dark metal. It sent shivers to my spine as I clicked the shutter. How does one make an interesting photograph when people are immersed in their mobile phones? This is a question that always comes to my mind whenever I walk the streets after work. Kodakan from the Artifacts from 52 Victoria series. A huge thank you to Joelcy Kay, Editor & Curator of Edge of Humanity Magazine for featuring Cubao last January. Last Thursday, I was able to carve out some time to finally get out and walk the streets with my camera around my neck. I can't tell you how good it felt to be looking and composing within the frame and pressing the shutter. This past year, I switched employment unexpectedly and my attention shifted to learning the new job. Such endeavor took up so much brain power and energy that it depleted my will to go out and shoot. However, I did manage to work on a quieter still life series on the weekends so I was not without my camera for the entire period. I am quite rusty but the good news is that I've reached a point where I am able to put my energies where it truly belongs and focus on taking pictures again. And, by God's grace, I got my old schedule back so I have time to walk regularly.